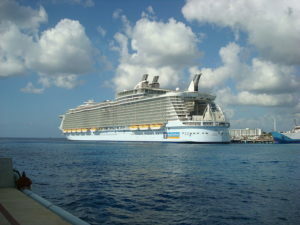 Royal Caribbean has unveiled its latest mega-ship. The cruise line has unveiled some major new things about the upcoming Quantum Ultra class vessel. The Quantum Ultra class Spectrum of the Seas will be the largest and most expensive ship in Asia when it sails from Shanghai beginning in June 2019. Specifically designed for the Chinese market, the ultra-impressive ship debuts in April 2019 and will set off on a 51-night ‘Global Odyssey’ from Barcelona to Shanghai taking its guests to 13 countries. Currently under construction at Neptun Werft’s shipyard in Rostock, Germany, Spectrum of the Seas is the first Quantum Ultra class ship for Royal Caribbean and when it sets sail on its first voyage, it will leave you breathless. New fleet first features have been introduced for the first time and others already seen on other Royal Caribbean ships have been enhanced. Spectrum of the Seas will accommodate 4246 guests at double occupancy and 1551 international crew members and Royal Caribbean claims the vessel will be ‘a quantum leap forward in ship design’. Spectrum of the Seas will boast new two-level 2,809-square-foot Ultimate Family Suites which is the line’s first-ever exclusive suites-only area with the Golden and Silver suite accommodations in a private enclave at the forward end of the ship. Guests in these suites will have keycard access, a private elevator and access to dedicated restaurant and lounge, and a completely private outdoor space for sunbathing called The Balcony. The Ultimate Family Suite can accommodate up to 11 guests and has an in-suite slide. The fleet’s first live karaoke venue and a virtual reality bungee trampoline are just some of a number of exciting features on the new ship. This entry was posted in Royal Caribbean International (RCI) and tagged cruise ship, cruise travel, Royal Caribbean International by writer. Bookmark the permalink.